Anelosimus eximius is a species of colonial spiders. Much like Tetragnatha guatemalensis they form large colonies which can contain thousands or even tens of thousands of individuals. This behaviour enables them to capture much larger prey items than other spiders of roughly the same size. Colonies can cover several square meters among tree canopies. Given that a single female can lay dozens of eggs and that there are usually ten females for ever male in a colony, there can often be incredibly large numbers of juveniles hatching in a single colony. 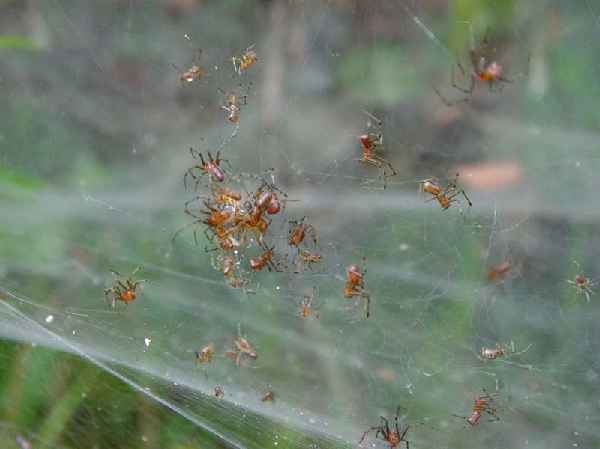 The juveniles disperse through the wind, like a lot of spiders and when the juveniles of a large colony hatch it can lead to a situation in which it appears to be raining spiders. Anelosimus eximius can be found in South and Central America.